Daylilies have enjoyed a surge of popularity in recent years. With their adaptability to heat and drought and their spectrum of colorful flowers, they have a well earned reputation as low maintenance perennials that fit the lifestyle of the busy gardener. Daylilies are not without pest problems, however. Fortunately, most are not serious and can be managed without using pesticides. Slugs are a problem, especially in partial shade where the plants stay wet for longer periods of time. Ragged linear holes and slime on the leaves are sure signs of slug damage. Discourage slugs by growing daylilies in full sun and by keeping mulch at least six inches away from the crown of the plant. A copper band can be used around plants that are particularly valued and chronically damaged by slugs. Slug baits are highly toxic, attractive to pets, and are not very effective in controlling the slugs. Slugs can also be trapped in saucers filled with beer or yeast solution, but you must be sure to refresh the saucers twice a week until no more slugs are trapped. Thrips produce white linear streaks in the foliage and the flowers. Heavy thrips infestations can seriously deform flowers as they open. Thrips are elongated in shape and are usually yellow in color. Their microscopic wings lack membranes and look like feathers. Fortunately, thrips damage is usually not too severe. Small black insects called minute pirate bugs often show up to control the thrips, and they can often be seen inside the flowers where they eat pollen to supplement their thrips diet. A diverse landscape with many micro-habitats will attract and conserve these beneficial insects. Another problem, russet spot, is without a known cause. It appears about the time that flowers are at their peak and is most commonly seen on plants grown in full sun. The leaves are uniformly marred by small, linear brown to tan spots. It is thought that fungi might be responsible since the problem has responded to fungicide treatment. At any rate, it appears that the problem is cultivar related since some plants always exhibit symptoms while others do not. The newer cultivars on the market seem to be relatively free of russet spot. Aphids can sometimes be a problem because of the damage they do to the flowers. Aphids commonly infest the developing flower buds on the ends of the flower scapes in June in relatively small numbers. Their damage is undetectable at first and never seriously threatens the plant. As the flowers open in July and August small spur-like projections appear on the outer surface of the petals. Although not terribly objectionable, these deformities are disastrous if you will be showing your daylilies. Pesticide treatment would not be warranted unless you require show quality blooms. If you want to avoid pest problems daylilies are a good choice for your garden. 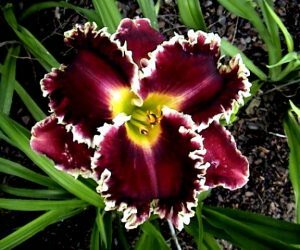 Pests and diseases rarely bother daylilies enough to compromise the floral display in the Summer garden, even if you vow never to treat them with pesticides.